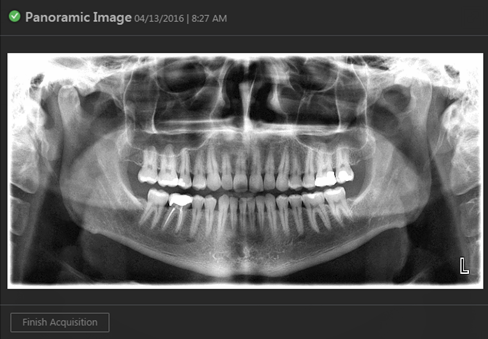 You can acquire images with a device (such as an X-ray sensor or an intraoral camera) or by importing image files (such as .png or .jpg files). The images will be attached to a patient's record upon acquisition. When you acquire images, you can customize the acquisition settings, and there are options for posting the associated procedure and billing the procedure to insurance. For the complete list of acquisition devices that are supported by Dentrix Ascend Imaging, see the "Supported Acquisition Devices" section. On the Patient menu, under Clinical, click (or tap) Chart, Progress Notes, Quick Exam, Treatment Planner, Perio, or Imaging. On the Chart, Progress Notes, Treatment Planner, Perio, or Imaging tab of a patient's clinical record, on the Imaging tab's menu, click (or tap) Acquire images. 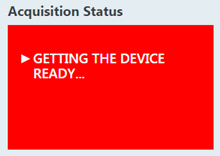 If this computer is not set up to acquire images, a message appears and asks you to perform the necessary setup before you can proceed with an acquisition. Click (or tap) the Click here link to download the acquisition agent. After you install the acquisition agent and the drivers for your acquisition devices, you can begin acquiring images. Click (or tap) Done. 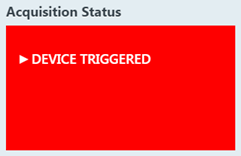 If you have not already accepted the diagnostic use policy, a dialog box appears. 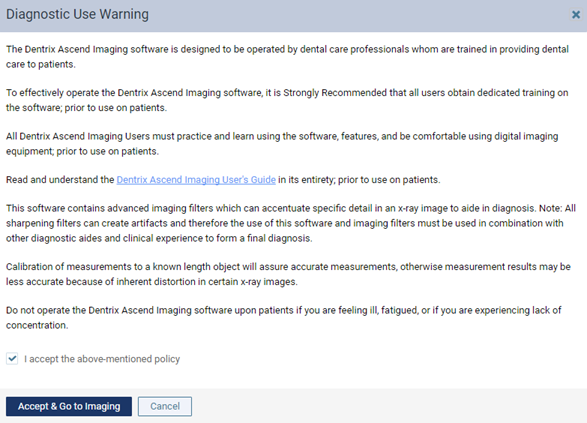 To begin using the imaging features of Dentrix Ascend, you must select the I accept the above-mentioned policy check box, and then click (or tap) Accept & Go to Imaging. 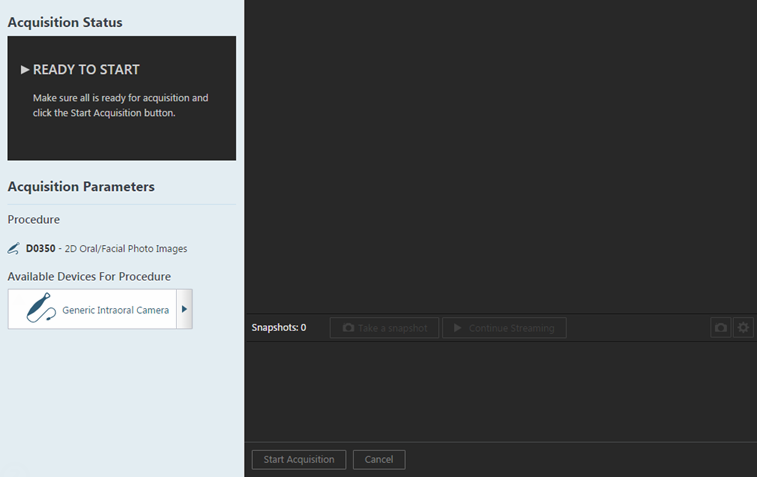 The options for acquiring images become available. 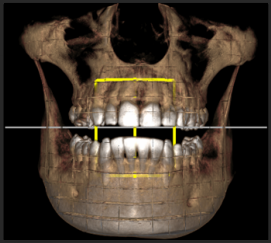 Under Imaging Procedures, select the procedure that you want to perform (each corresponds to a particular acquisition type: individual intraoral X-ray, intraoral X-ray series, extraoral X-ray, intraoral photo, extraoral photo, CAD/CAM scan, or 3D volume). The options for the selected procedure become available. 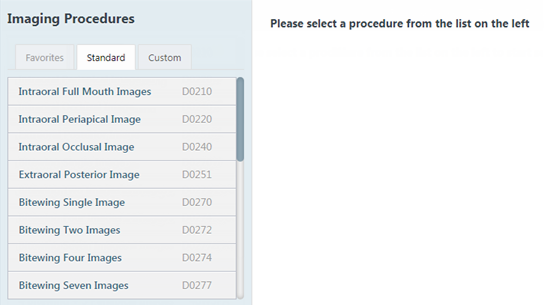 Apply charges - To post the fee for the selected procedure (such as D0210 for a full mouth series), select the check box. To post a zero amount for the procedure, clear the check box. Bill to insurance - Specify whether you want to bill or not bill the patient's insurance carrier for the procedure by selecting or clearing the check box, respectively. Provider - Select the provider who you want to associate with the procedure. 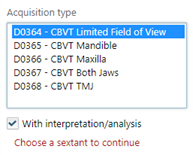 Set up the Acquisition Options that apply to the corresponding acquisition type. 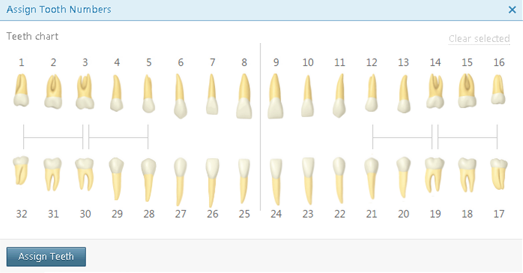 On the Tooth chart, select the teeth that apply to the current acquisition session. Note: To deselect all selected teeth, click (or tap) the Clear selected link. To allow for the automatic retaking of the radiograph (without having to click, or tap, Recapture) until a satisfactory image is acquired, select the Enable auto-repeat check box. Only the last image you acquire will be saved. 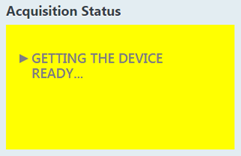 Under Task to Perform, on the Acquire Images tab, select the desired device in the Available Devices button pop-up list if it is not already selected. 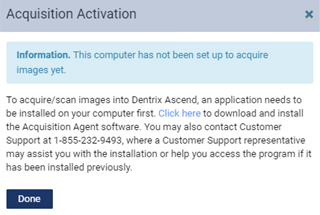 Note: For the complete list of acquisition devices that are supported by Dentrix Ascend Imaging, see the "Supported Acquisition Devices" section. For a full-mouth series - Select FMX 18 or FMX 21. For a 4-bitewing and 4-periapical series - Select 4BW + 4PA or 4BW + 4PA Alt. Under Acquisition sequence, select "Default sequence" or a custom order (if any). To change the order of the acquisition sequence, on the graphic with the numbered boxes, click (or tap) each box in the order that you will acquire the images. To undo the previous selection, click (or tap) Undo as needed. To undo all selections, click (or tap) Reset. When you finish specifying the order, to save the custom sequence for future use, type a name for the sequence, and then click (or tap) Save as ([sequence name]). To delete a custom sequence, with that sequence selected, click (or tap) the white Delete button , which then turns red, and then click (or tap) the button again. The first time you attempt to use an intraoral camera with Dentrix Ascend Imaging on any computer, when a message from the browser appears and asks if you want to allow the browser to have access to the camera, allow it. Select an Acquisition type. The selected type determines which procedure will be posted. For most acquisition types, the applicable teeth become selected automatically on the Tooth chart. For the other types, select the correct teeth (such as a sextant) by clicking (or tapping) one of the applicable teeth or somewhere within the corresponding square bracket. Note: To deselect all selected teeth, click (or tap) the Clear selected link. The link is available only if you have selected teeth manually. If desired, select the With interpretation/analysis check box. The check box might not be available with every acquisition type. 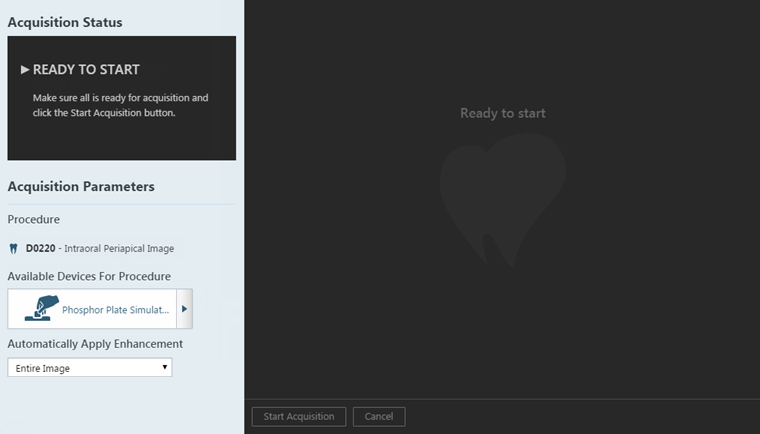 Click (or tap) Proceed with Acquisition to start acquiring images for the corresponding acquisition type. The selected acquisition device begins initializing. Then, the X-ray sensor begins arming. Then, the X-ray sensor becomes ready for exposure. Note: A phantom, test target, and/or another non-human object should be X-rayed when installing or using any image acquisition device for the first time in Dentrix Ascend Imaging to verify proper operation prior to use on live patients. 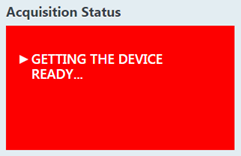 To change the acquisition device, select a device in the Available Devices for Procedure button pop-up list. 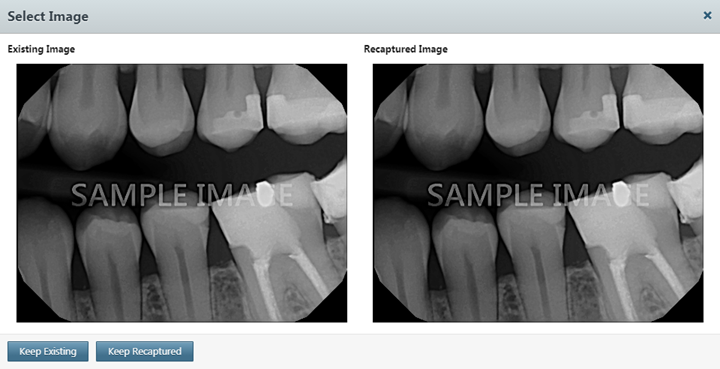 In the Automatically Apply Enhancement list, select the type of enhancement that you want to have applied automatically to the image that will be acquired (Entire Image, For Perio, For Endo), or select Not Enhanced to not apply any enhancement. Note: When viewing an image after it has been acquired, you can turn the enhancement off and on. The original, raw image is preserved. 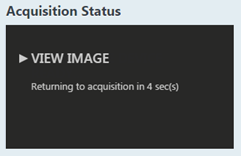 For more information about enhancements and turning them on and off, see the "Processing images" section. Note: Radiation from an X-ray source initiates the imaging device (sensor) to capture an image, and this is controlled by someone triggering the X-ray source. The Dentrix Ascend Imaging program does not directly control the X-ray source or exposure settings. The resulting image is saved to the patient's record, and a preview of the image appears. If you are acquiring in endo mode, the Recapture button is not available. The sensor is re-armed automatically and becomes ready for another exposure. Continue retaking the radiograph until you have acquired a satisfactory image to replace the previous image. If you are not acquiring in endo mode, the Recapture button is available. To replace the image that you just acquired, click (or tap) Recapture. Reacquire the image. In the Select Image dialog box that appears, click (or tap) either Keep Existing to keep the original image or Keep Recaptured to replace the original image with the new image. Note: Radiation from an X-ray source causes the phosphor plate to capture the image, and this is controlled by someone triggering the X-ray source. The Dentrix Ascend Imaging program does not directly control the X-ray source or exposure settings. 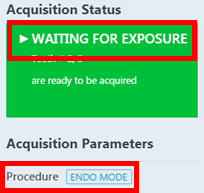 From the Automatically Apply Enhancement list, select the type of enhancement that you want to have applied automatically to the image (Entire Image, For Perio, For Endo), or select Not Enhanced to not apply any enhancement. Click (or tap) Start Acquisition. When the scanner is ready, put the phosphor plate, with the edge with the dot or letter pointing up, in the scanner according to the manufacturer's instructions. When the scanner finishes scanning the plate, the resulting image is saved to the patient's record, and a preview of the image appears. Note: To replace the image that you just acquired, click (or tap) Recapture. Reacquire the image. In the Select Image dialog box that appears, click (or tap) either Keep Existing to keep the original image or Keep Recaptured to replace the original image with the new image. Close the third-party imaging program. 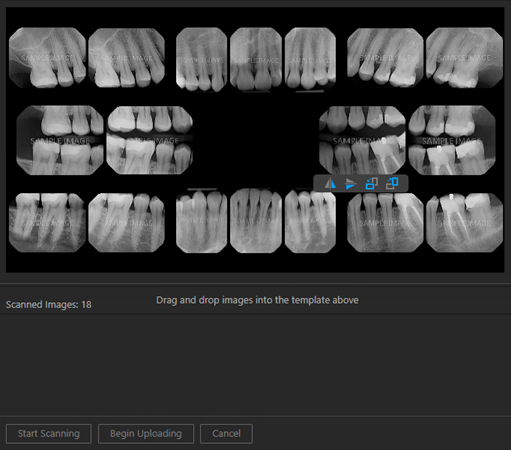 The resulting image appears in the Dentrix Ascend Imaging program automatically. To pause acquisition and change the acquisition device, click (or tap) Pause, and then select a device from the Available Devices for Procedure button menu. Click (or tap) Continue to resume acquisition. To skip ahead in the acquisition sequence, click (or tap) Skip Forward. This button is available only if the current step in the sequence is not the last step. To go backward in the acquisition sequence, click (or tap) Skip Backward. This button is available only if the current step in the sequence is not the first step, and if the previous step in the sequence does not have an image. Radiation triggers the X-ray sensor. Wait until the timer counts down to zero to proceed to the next step in the acquisition sequence. The current step in the acquisition sequence and the applicable teeth are selected for your reference. To stop the acquisition session before completing the series, click (or tap) Finish Acquisition. You can resume the incomplete exam later on if necessary. To replace the image that you just acquired, click (or tap) Recapture. Reacquire the image. In the Select Image dialog box that appears, click (or tap) either Keep Existing to keep the original image or Keep Recaptured to replace the original image with the new image. Repeat steps a - f until you finish acquiring the series. 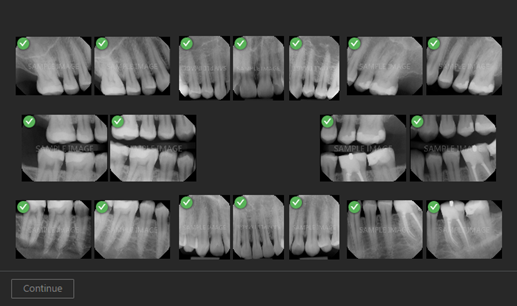 From the Automatically Apply Enhancement list, select the type of enhancement that you want to have applied automatically to the images (Entire Image, For Perio, For Endo), or select Not Enhanced to not apply any enhancement. Click (or tap) Start Scanning. When the scanner is ready, put the phosphor plates, with the edges with the dot or letter pointing up, in the scanner according to the manufacturer's instructions. As the scanner finishes scanning a plate, the resulting image appears as a thumbnail image on the panel at the bottom of the Dentrix Ascend Imaging program. 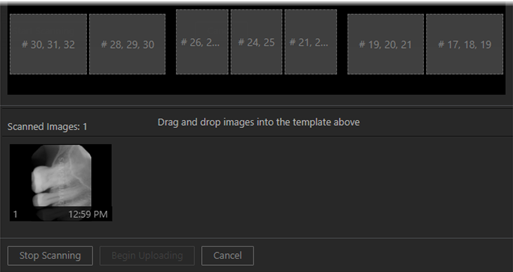 One at a time, drag the thumbnail images from the panel to the appropriate boxes of the template. Note: If the orientations the phosphor plates were correct when the radiographs were taken and when inserting them into the scanner, the images will have the correct orientation in the series. When you drop a thumbnail image into a box of the template, the image is rotated automatically as needed for that position in the series. To change the orientation of an image in the template, select it to view the toolbar, and then click (or tap) any of the available buttons as needed: Flip Horizontal, Flip Vertical, Rotate Counterclockwise (90 degrees), and/or Rotate Clockwise (90 degrees). 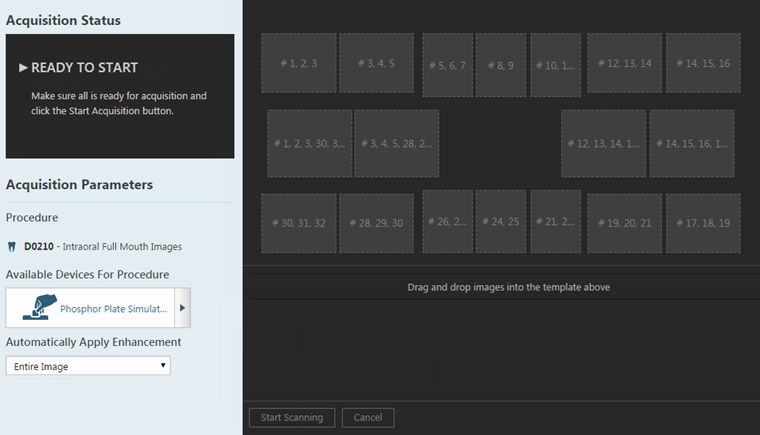 To swap two images in the template, drag one of the images to the box with another image. To remove an image from the template, drag it back to the panel at the bottom. 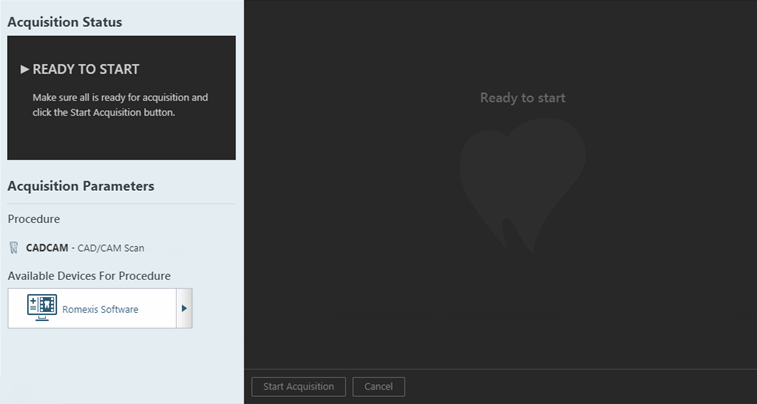 Click (or tap) Start Importing. The corresponding third-party imaging program opens. Note: Radiation from an X-ray source causes the sensor to capture the image, and this is controlled by someone triggering the X-ray source. The Dentrix Ascend Imaging program does not directly control the X-ray source or exposure settings. 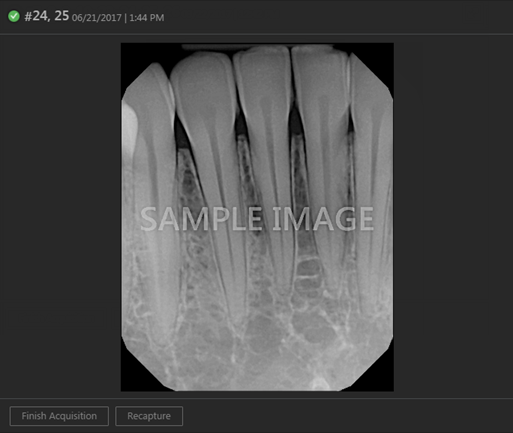 The resulting images appear as thumbnail images on the panel at the bottom of the Dentrix Ascend Imaging program automatically. Use the options on the TWAIN interface window that appears to get ready to use the X-ray device. Dentrix Ascend Imaging waits to obtain the image from the device. Note: Radiation from an X-ray source initiates the imaging device to capture an image, and this is controlled by someone triggering the X-ray source. The Dentrix Ascend Imaging program does not directly control the X-ray source or exposure settings. When the scanner is ready, put the phosphor plate in the scanner according to the manufacturer's instructions. The live video stream from your camera appears. Note: To tune your camera's settings, you can click (or tap) the Tune Camera button . With the camera properly positioned, use the button on your camera to pause or freeze the live video stream (or click, or tap, Pause Streaming). Use the button on your camera to capture the current video frame (or click, or tap, Take a snapshot). 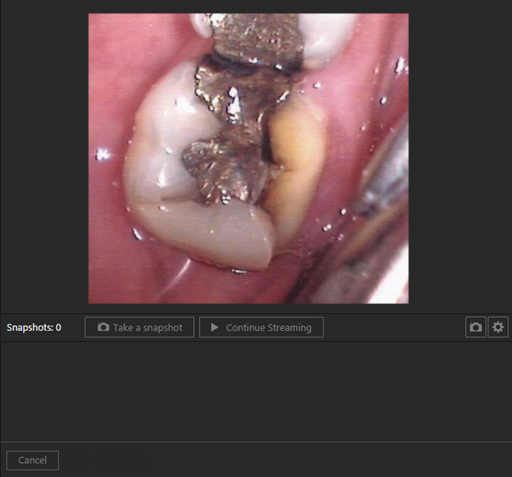 The resulting image is added to the snapshot panel, and the video stream automatically becomes live again. Repeat steps c - d as needed to acquire additional snapshots. On the snapshot panel, clear the check box of the snapshots that you do not want to save. Click (or tap) Assign Images. To save one or more snapshots as intraoral images and assign tooth numbers, select the snapshots that pertain to the same teeth (deselect snapshots that do not pertain to the same teeth), and then drag them to the Select Teeth, UR/UL/LR/LL, Upper Jaw, or Lower Jaw box. 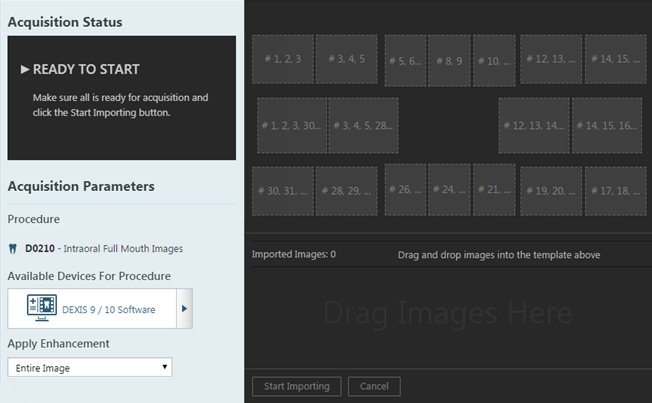 If you drag snapshots to the Select Teeth box, select the applicable teeth, and then click (or tap) Assign Teeth. To save one or more snapshots as extraoral images, select the snapshots that are extraoral images (deselect snapshots that are not extraoral images), and then drag them to the Extraoral Photos box. To save the snapshots on the snapshot panel as intraoral images but not assign tooth numbers at this time, leave those snapshots on the snapshot panel. 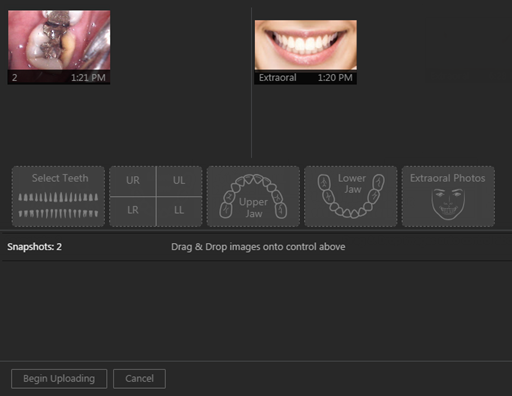 Assigned intraoral images appear on the left side of the preview area; extraoral, on the right. 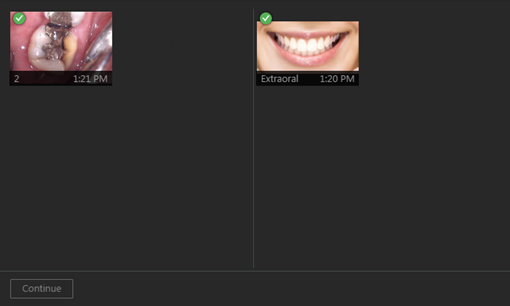 Note: If you have a mix of intraoral and extraoral images, they map to one procedure (D0350), which will appear in the progress notes with two icons. Also, you can delete or reassign the intraoral or extraoral exam as needed in the future. Acquire the images in the third-party imaging program. Acquire the image in the third-party imaging program. 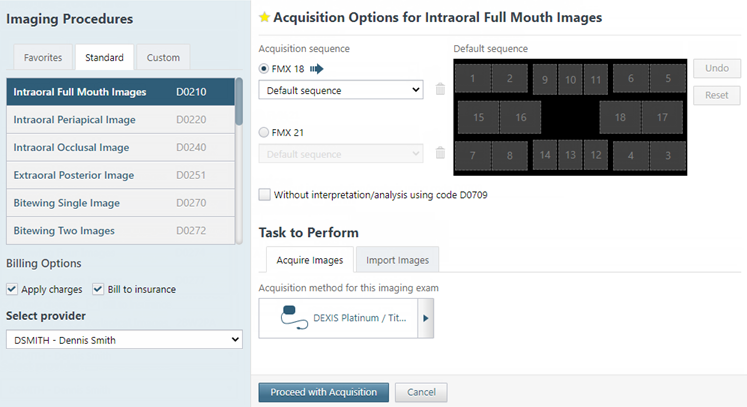 Click (or tap) Finish Acquisition or Begin Uploading (only for an intraoral X-ray series using phosphor plates or a software device or for intraoral/extraoral photos). 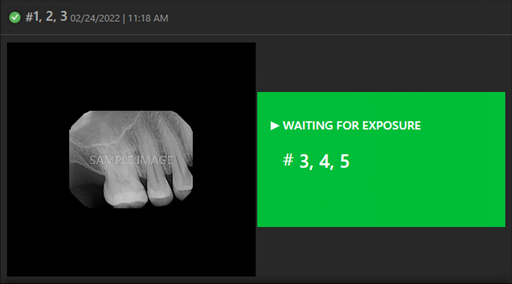 Note: For an intraoral X-ray series using phosphor plates or a software device, if not all thumbnail images have been mounted into the template when you click (or tap) Begin Uploading, a confirmation message appears. If you choose to continue, only the mounted images will be saved. If any images fail to upload, a message appears and provides the option for you to recover the images. Click (or tap) Recover Images to begin the recovery process. 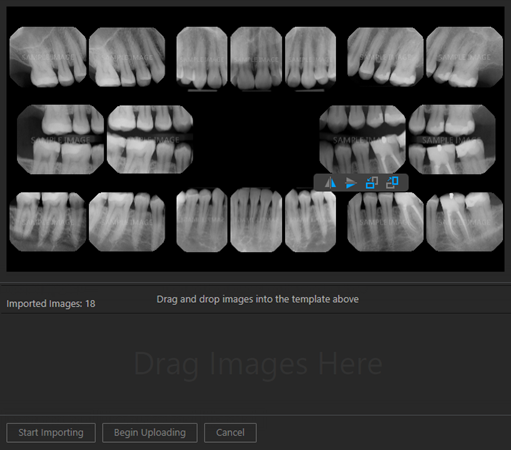 For an intraoral X-ray series using phosphor plates or a software device or for intraoral/extraoral photos, when the images are finished being saved to the patient's record, click (or tap) Continue. 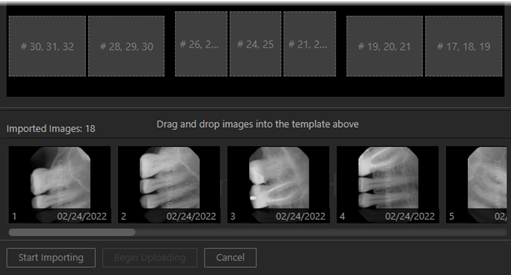 For a set of intraoral photos (or an individual intraoral photo or X-ray), you can assign tooth numbers to a selected snapshot by clicking (or tapping) the Edit button . Under Image Navigator, click (or tap) an image thumbnail. You can skip this step if there is only one image thumbnail. A larger version of the current image appears in the viewing area. Click the Edit button . 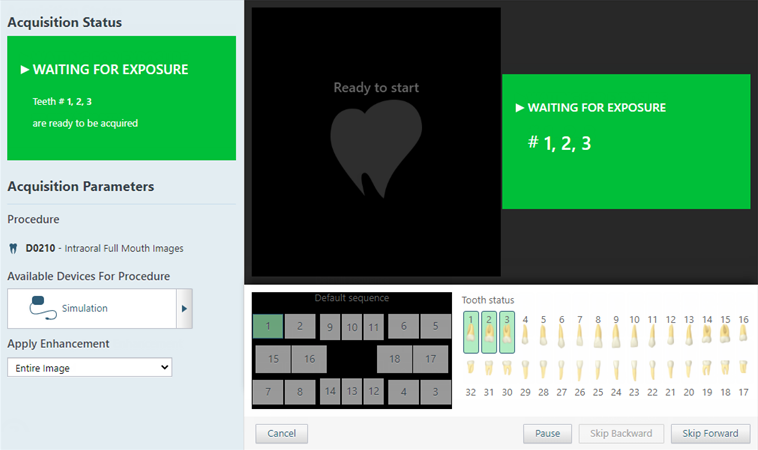 The Assign Tooth Numbers dialog box appears. Select the applicable tooth numbers. 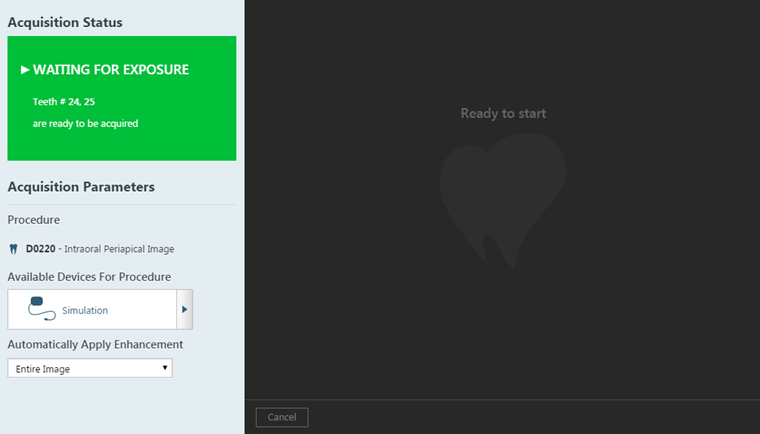 Click (or tap) Assign Teeth. In order to locate images that did not upload to Ascend you will need to follow the exact same process for acquiring the images, but instead of using a device for the Acquisition Method you will choose Import From File.